And that’s true. 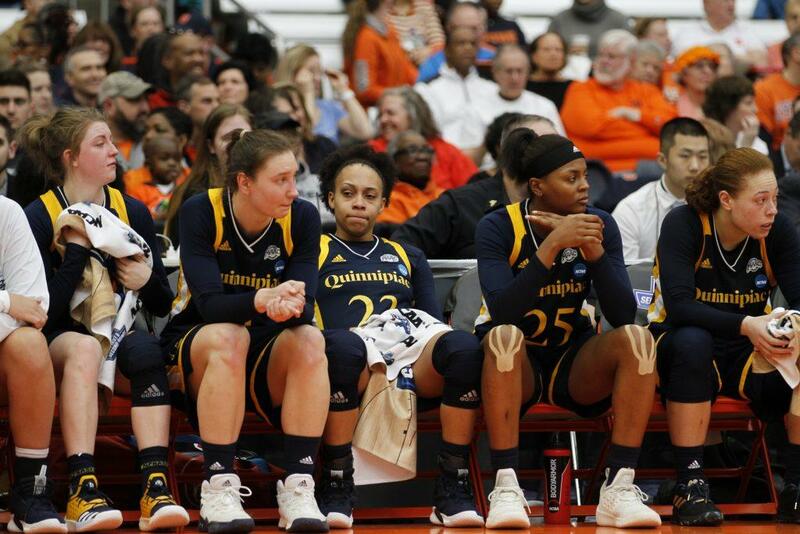 But for the Quinnipiac women’s basketball team, they were just hoping to push off the end for a little longer. A highly anticipated NCAA First Round matchup between the Quinnipiac Bobcats (26-6, 18-0 MAAC) and the South Dakota State Jackrabbits (27-6, 15-1 Summit) ended in disappointing fashion for Tricia Fabbri and her squad, as a strong first half for South Dakota State and excellent rebounding on the offensive glass pushed the Jackrabbits by the Bobcats, 67-56. Fay was right – all of their players could shoot, and all of their players could drive. That’s part of the reason why the Jackrabbits entered the game with the 12th highest scoring offense in the entire nation. Averaging exactly 80 points a game, South Dakota State’s offense needed to be clicking on all cylinders if they were going to beat Quinnipiac’s second best scoring defense in the nation. At the center of it all for South Dakota State was senior Macy Miller, the back-to-back Summit League player of the year who averaged 18.1 points a game and shot 44 percent from beyond the arc. Miller ended the first half leading all scorers with 12 points, and only got better in the last twenty minutes. She finished with a double-double, scoring 28 points and hauling in 11 rebounds. The Bobcats didn’t go down without a fight, as they cut the lead to three on numerous occasions in the fourth quarter. Whenever the Bobcats made it close, though, the Jackrabbits always had an answer. And when the final buzzer sounded, the Bobcats had suffered their first loss since December 30, 2018. The loss signifies the end of something more than a season for the Bobcats. It signifies the end of an era. A senior class that experienced three NCAA Tournament appearances, three NCAA Tournament wins, a trip to the Sweet Sixteen, two undefeated conference seasons, and a 52-game conference winning streak says goodbye to the program for the final time. “Leaving the court and everyone is giving you hugs, you know it’s the last time you are going to be on the court playing with your teammates for the last time. It’s obviously a sad feeling and bittersweet,” said Fay. Despite losing an iconic group of seniors, Fabbri wants to look at the loss from a different point of view. “Unfortunately, I’m saying this too soon – the best senior class to come through the Quinnipiac Bobcats in history,” said the Quinnipiac head coach. That title is a lofty praise, but it may very well be true. The senior class that the Quinnipiac Bobcats say goodbye to are undoubtedly the most accolated group in the history of the program. For Fabbri, she will be faced with the tall task of replacing Brittany Martin, Edel Thornton, Paula Strautmane, Jen Fay, and Aryn McClure. Though, that is a problem she says she’ll keep on the backburner until next year. For now, she’ll spend time with her seniors.